Great when visiting theme parks! Slips over the hand and onto the wrist to keep your keys, I.D., credit card, or cash secure while on vacation, at the beach, around town, or working out. Discourages pick-pockets! Ideal for carrying your identification while operating personal watercraft. Stretchable nylon and neoprene foam construction provides comfortable wear and padded protection. For extra security, it can be reversed so the hook and loop closure is on the inside against the wrist. 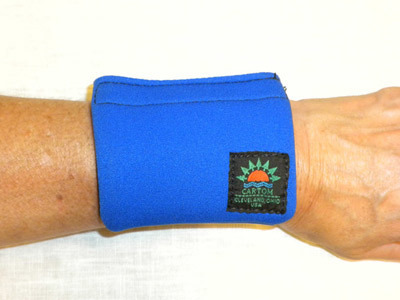 In size XXL, the Wrist Wallet can be worn on most ankles. Plastic re-sealable inner zip bag included for those wet occasions. Size S/M fits wrist circumference of 5-3/4 to 6-1/2 inches, L/XL fits 6-3/4 to 9 inches and XXL 9-1/4 to 11 inches.